Good afternoon, lovelies! If the daffodils brightening my kitchen are any sign, spring had officially arrived in Texas. As y'all know by now, my wardrobe obsessions are decidedly seasonal. This time of year, I want nothing but classic prints and bright, cheerful colors. Give me florals, plaids, and colors that belong on Easter eggs. 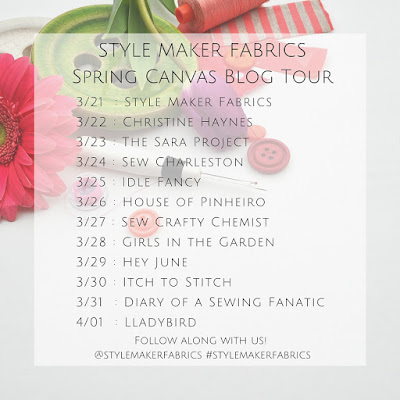 Luckily, Michelle of Style Maker Fabrics contacted me last month about joining in on the Spring Canvas Blog Tour. With over 150 new fabrics in stock, this tour is a chance to showcase some gorgeous fabrics and springtime fashions. Since I loved my last Style Maker garment so much--that dress gets worn every other week, I swear--I jumped at the chance to check out Michelle's newest line-up. 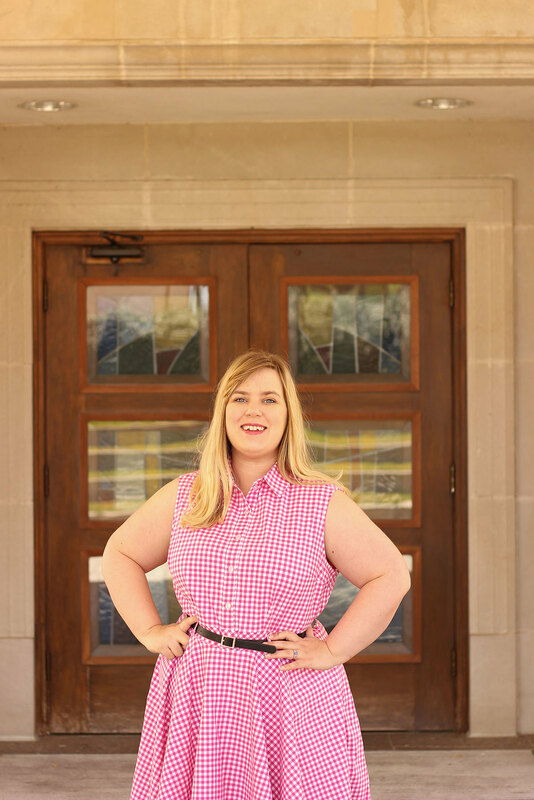 Though there were tons of great options, I was instantly smitten with this bright pink gingham shirting. With a good deal of stretch, thanks to a small lycra content, this crisp cotton was perfect for my ideal spring garment: a shirtdress. That's right, a shirtdress. My longtime sartorial stand-by is officially in this season. Designers, from Jason Wu to Zac Posen, are putting collars on everything and magazines are declaring buttoned dresses a "must-have." Convenient, really, when fashion falls in line with personal preference. I was planning on making another thousand shirtdresses anyway, but it's nice to do so with impunity. Even better, companies have released a slew of new shirtdress patterns to try out. 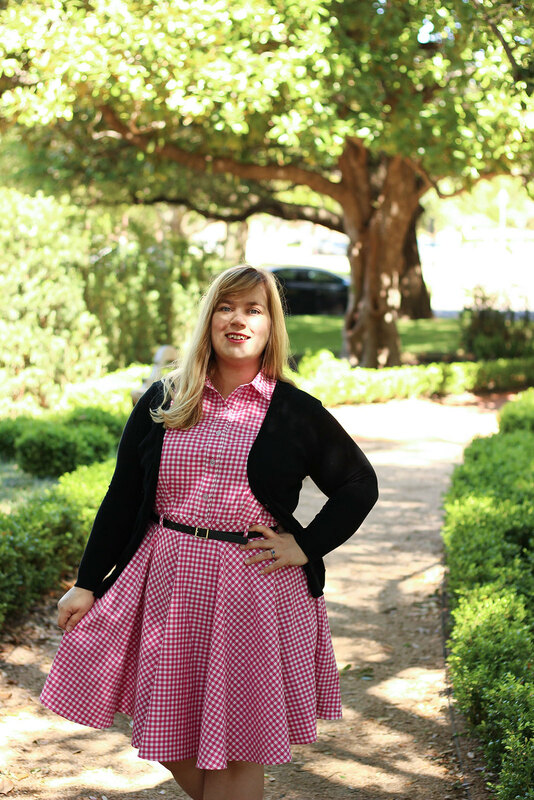 There's Melissa Watson's new half-shirtdress (M7380), McCall's new shirt-tail version (M7351), and Butterick's princess seamed beauty (B6333). For this particular project, I chose McCall's 7351. Well, sort of. Once the fabric arrived, my brain started spinning. 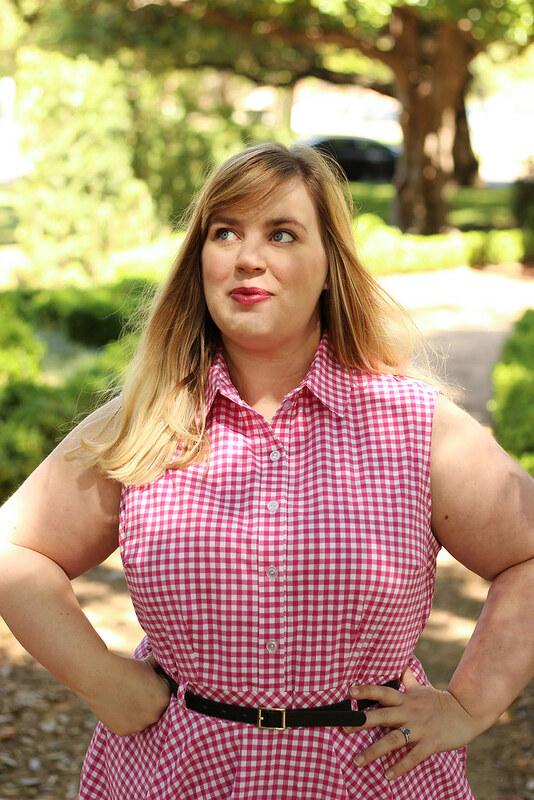 All those little pink checks would look fabulous as a traditional shirtdress, but they would look stupendous as a half-shirtdress. Visions of separate waistbands and swirling circle skirts danced in my head. So, I set about turning my new shirtdress pattern into my perfect half-shirtdress pattern. I've done this once before, with the old standby M6696, though that one was paired with a gathered skirt. 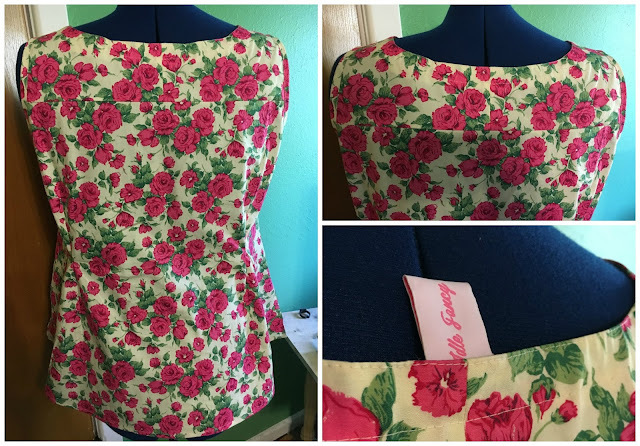 I really wanted to check out the bodice of McCall's new offering, so I set about making the adjustments to that pattern instead. The bodice was shortened by two-and-half inches, a waistband was drafted to make up the length, and a full 3/4 circle skirt was subbed in for the shirt-tail hemline of View A.
Additionally, I took a few fit adjustments. This pattern comes with cup sizes (Hallelujah! ), but I still needed a bit more room in the bodice and a bit less room at the waist. To that end, I took a 2-inch FBA on the size 20 bodice. This added a waist dart, allowing me to also take out some extra room through my midriff. Half-shirtdress are much more fitted than full shirtdresses through the waist, so most women will need to take out room there, even if a pattern fits her well before the drafting changes. By far, the most stressful part of making this dress was actually cutting out the pattern itself. 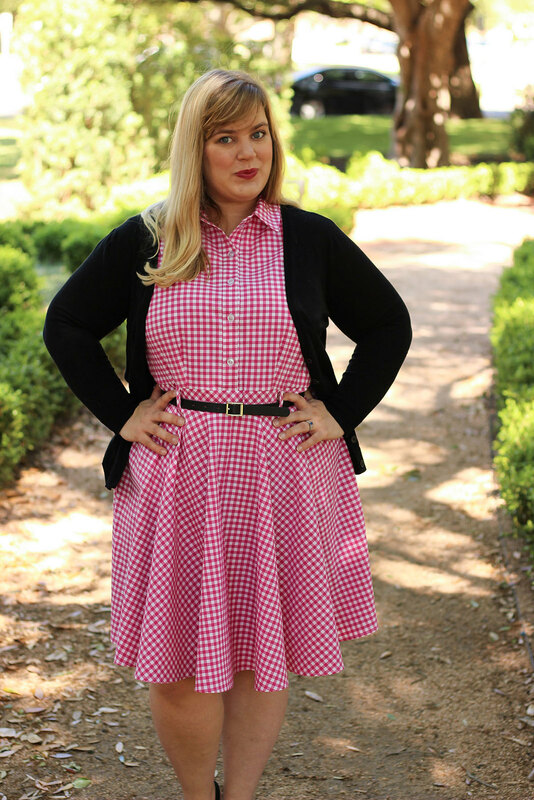 I tend to be hyper focused on pattern matching anyway, but with gingham it's especially important. I chose to cut out a few pieces on the bias--yoke, midriff, belt loops, and collar stand--to make cutting out simpler and give the garment some added visual interest. The checks on this fabric are exactly a quarter-inch, which also made pattern matching easier than most other plaids. I cut out what I could in a single layer, laid pieces out according to gingham lines, and was good to go! When it came to construction, everything was gloriously straightforward. This cotton takes to sewing and pressing like a dream, as you would expect from a high quality shirting. It also looks completely dishy, when top-stitched with white thread. Good news for those who like to do everything by machine! I'm a devotee of hand-sewing (Any excuse to binge watch iZombie, let's be honest), but opted for the faster route on this dress. The bodice bands are top-stitched on both sides, the hem was narrowly turned and stitched, and the collar was assembled with Andrea's famed technique. Five clear, plastic buttons finish off the bodice and the armscyes are faced with pink gingham bias tape. Y'all, I absolutely adore this dress. 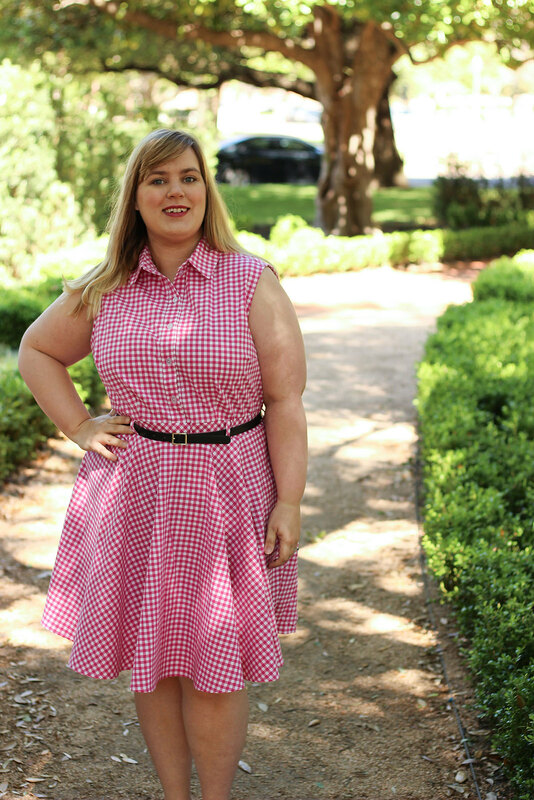 Between the bright, springy gingham and classic styling, it makes me even more joyous about warmer days. This fabric pairs brilliantly with black accessories and other colors, alike. Though I'm sporting black in all these pictures, I'm wearing it with a bright green belt today and feel like the very personification of spring. This dress also has me reevaluating my tried-and-true shirtdress. Though I still love my original McCall's 6696 dresses, I may actually prefer 7351, in the end. The collar on this one fits beautifully, without any adjustment, the shoulders only need the slightest bit of narrowing, and the armscye hugs the body without gaping. I'm really looking forward to trying out the full-length version, next. That shirt-tail hem is gorgeous! 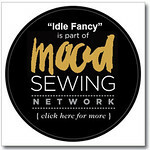 Thank you again to Michelle, of Style Maker Fabrics, for providing the fabric for this dress and including Idle Fancy in the Spring Canvas Blog Tour. Be sure to check out the other stops on the tour for more spring inspiration. 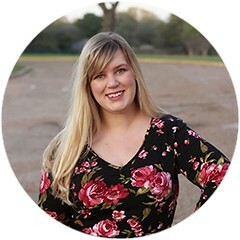 Tomorrow, Rachel will be posting something truly gorgeous at House of Pinheiro! Now, I have to go order more of this fabric. After Sam finished telling me how cute this dress looked, he requested a button-down in the same fabric. We'll see how long that takes me to finish! Does anyone have a favorite recommendation for a man's tailored shirt pattern? Hello there, kittens! After six weeks without blogging, thanks to various travels and a shoulder injury that made sewing hazardous, I have things to show you. Prepare for a barrage of Idle Fancy posts, in the coming weeks. My riding jacket is finished, McCall's 7357 has made a dent in my Liberty stash, and there is a gingham shirtdress half-sewn on my work table. However, first, we must talk about quests. My family is big on quests. It's not enough to settle for the readily available thing. No, instead we tend to search and hunt and plot and strive for the platonic version of everything. As a child, this meant visiting every McDonald's until I found the Hawaiian Fun Barbie toy and scouring antique stores for blue spine Nancy Drew books with their original covers. As an adult, I've tempered this impulse a bit. It's not actually productive to require perfection in everything, after all. Who knew? And, yet, I do find myself on the odd quest. Whether it's sewing the perfect shirtdress or finding the most hydrating lipstick, my orientation to the world leans toward persnickety and goal-oriented. This spring, that impulse turned its eye toward tunic topics. March hit and, suddenly, I required the perfect woven blouse to pair with jeans. Something loose, but with shaping. Something swingy, but not tent-like. Something, it turned out, that only existed in my mind. Curved, split hemline. As anyone blessed with generous hips knows, woven blouses can be hell to move in. They might fit well while we're standing up, sure, but try to sit down or bend over or dance a jig! That way unsightly creases and pulling lie. A split hemline allows freedom of movement, without tent-like proportions. Loose, but with shaping. Most tunic patterns out there are dartless rectangles, aiming to cover us in yards of flowing fabric. I love the ease of those patterns, and the look of tunics in general, but my body is easily lost in such garments. Waist shaping and bust darts allow me to recognize my shape, but keep the ease of design. Opportunities for fabric mixing. Mixing prints and solids FTW! 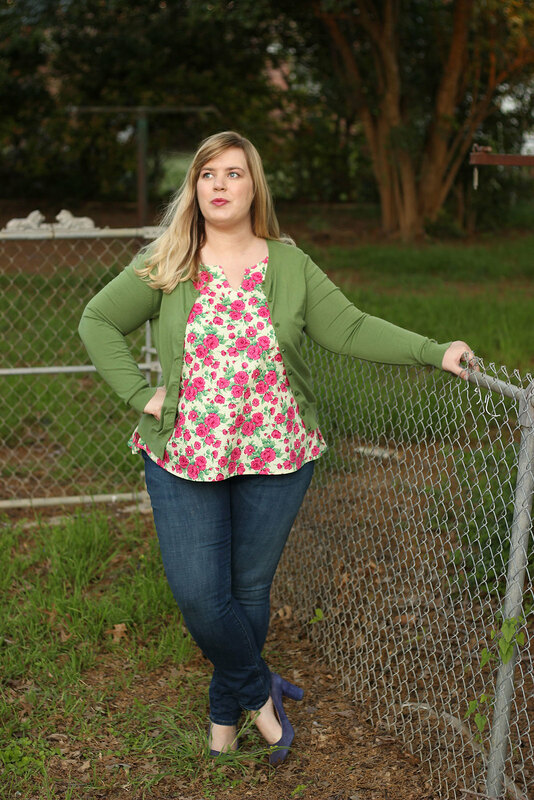 My ideal blouse allows for natural use of multiple fabrics, with separate yoke pieces and interesting design details. Lower neckline. 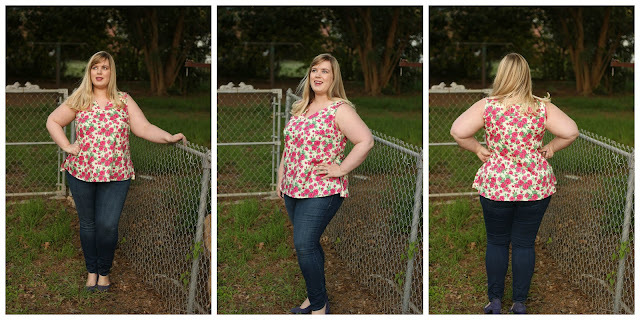 When wearing a loose top, especially, I can't stand a high neckline. Give me a peek of collarbone and cleavage to liven things up, please. Multiple cup-sizes. All the better, if this dream pattern makes allowances for larger busts. While I am quite comfortable with FBAs, I still prefer not having to fuss with a pattern for hours before actually using it. This also rules out any pattern that would require me to grade up substantially. Spoiler alert: this pattern doesn't actually exist. Vogue 9109, with its multiple cup sizes and swingy silhouette, is as close as it comes. I almost sprung for it, but started tallying the pattern changes in my head. The neckline needed to come down, back shaping had to be added, and opportunities for fabric matching were slim. Add in an additional FBA and why the hell was I paying Vogue prices for a simple tunic top? This, dear ones, is why slopers exist! With my lackluster drawing skills, I drew up a plan. 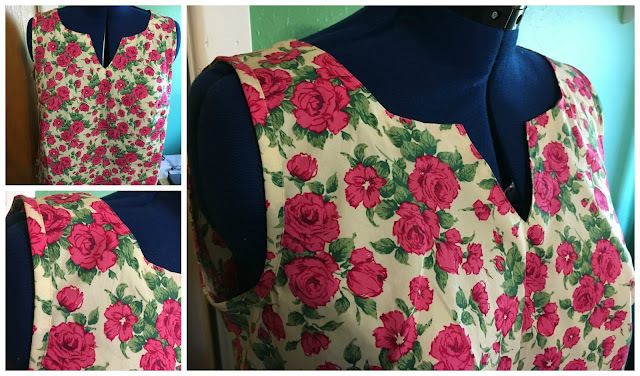 Using my oft-ignored bodice sloper, I would create my perfect woven top. Made to my specifications, it would fit beautifully and have just the right amount of swish. French curves were unearthed and inspirational questing music was turned up to 11. Let's take a closer look, shall we? The front of the blouse is fairly simple. I elongated my sloper to mid-hip length and swung out from the bust line to a floating, curved hem. Shaping is added through side bust darts and a subtly cinched side seam. To avoid it becoming super basic, I opted for a more interesting notched neckline. On the back of the tunic, the waistline is nipped in by twin fish-eye darts and a yoke gives opportunities for mixing fabrics, in the future. The back hemline dips slightly lower than the front and there's a split at the side seam, where the two meet. *If I'm going to the trouble of drafting something, you better believe it's getting a name! The fun thing about drafting my own pattern is that construction is also on my own terms. As someone with Opinions on everything, this suits me well. The finish out of this blouse ended up having a lot of my favorite techniques, which made the sewing process all the more fun. Both armscyes are enclosed with exposed bias tape, while the neckline was turned with a facing to allow more precision with that front v-neck. On the back, I top-stitched the facing in place to secure it firmly and add a bit more interest. All the major seams are also top-stitched, which is such an underutilized method of seam finishing, but one I love. Once the seam is sewn, I fold each side under, then stitch along the fold from the outside to secure them. The resulting finish is both sturdy and super clean. Thanks for the suggestion, vintage sewing books! For this particular tunic, I used leftover Liberty of London cotton poplin in my favorite print, Carline. If I'm breaking out the roses, you know it's true pattern love. Next time, I am going to add a bit more stability to the neckline, which will allow that V to lie symmetrically on the body. It didn't register to me in real life, but I definitely notice its tendency to cave inward in pictures. All in all, though, I totally dig this tunic. It's simple, yes, but it's also exactly what I wanted. I'm wearing jeans fairly often, these days, and feel most comfortable when they're paired with swingy cotton blouses. The skinnies + tunic silhouette may not be everyone's cup of tea, but it is absolutely mine. 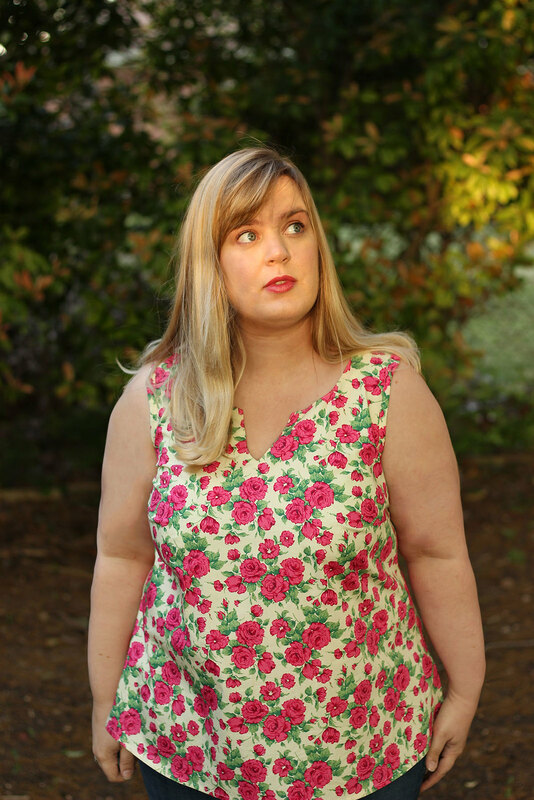 All the better that this particular tunic suits both my curves and my need to sew all the prints!